With ferocious ambition combined with great natural ability, Croatia's world champion high jumper Blanka Vlasic is successfully following in the footsteps of her idol Stefka Kostadinova. She now has two major goals in her sights, the first being Olympic gold at the Beijing Games in 2008 and the second, the coveted world record currently held her Bulgarian idol Kostadinova who lept 2.09m. Born in 1983, the leggy brunette is already a huge hit with the fans after performing her trademark dancing routine after making successful jumps. Double junior world champion in 2000 and 2002 and world indoor bronze medallist in 2004 followed by silver in the same event in 2006 and then gold in 2008, she is the girl to beat after her 2007 world outdoor title in Osaka. 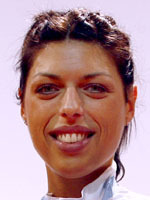 To make her winning performance in Japan even sweeter is the fact she came back from a thyroid operation in 2005 and came within centimetres of Kostadinova's mark after wrapping up the world gold. Her father was a gifted decathlete and still holds the Croatian record for points as well as winning the 1983 Mediterranean Games in Casablanca which inspired his daughter's christian name. She picked up the bug for competitive sport at a young age and it was Kostadinova's Olympic triumph at Atlanta in 1996 which pushed Vlasic to make a go of her athletics career. "Stefka is the most complete high jumper of all time. She has an unparalleled list of honours and her brightness was and still is immense. It is like her that I want to be," says Vlasic. Not only is she now world champion but she is also the joint second highest jumper outdoors of all-time alongwith Bugaria's Lyudmila Andonova. There has also been consistency in her progress. She was eighth at the 2000 Sydney Games when just 16 years-old and quickly identified as one for the future. From there she continued to better her personal best and in 2007 went better than her previous jumps on four occasions. At Doha, she jumped 2.04m, then 2.05 in Madrid, 2.06 in Salonika and 2.07m in Stockholm. She jumped 2m or more in 11 of her 13 competitions that year. Her gold medal in Osaka also erased any psychological barriers that she could get to the top. "I know now that anything is possible." Olympic glory and the world record could be next to come her way.